Cruising with Bateaux London's Sunday Lunch Jazz cruise is the perfect way to relax and indulge whilst soaking up the atmosphere of the River Thames. 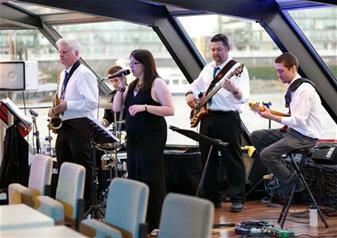 The two and a half hour cruises offer a three-course set menu and live jazz entertainment performed by our musicians. Ideal for celebrating a special occasion or bringing friends and family together, the Thames River Sunday Lunch Jazz cruise passes most of London's famous sights: Houses of Parliament, London Eye, Tate Modern, Millennium Bridge, Shakespeare's Globe, St Paul's Cathedral and Tower Bridge. The Thames Sunday Lunch Jazz Cruise features a live band performing well known songs where the general theme is 'American Songbook' with easy listening classics from artists and composers like George Gerswhin, Cole Porter, Frank Sinatra and George Benson. After the initial thrill of cruising, guests can sit back, relax, listen and enjoy familiar songs beautifully arranged and performed by expert musicians. Dress Code: On Sunday Lunch Jazz Cruises the dress code is smart casual - no shorts or trainers are allowed on board. Bateaux London reserves the right to refuse entry based on inappropriate attire. Refunds will not be offered under such circumstances. Child Policy: Children under the age of 5 are discouraged onboard due to company health and safety policy. Prams, bassinets and pushchairs are not permitted on our vessels. Child menu available for those aged 5 - 11 years of age.